I haven’t talked about my plants a lot here, but that’s about to change. I love my plants. While they make our home look cooler and more inviting, I think of them as more than just home decor. These guys are living beings, and they’re dependent on me to keep them in good health. They’re kind of like pets if you think about it. Sure they don’t snuggle with me, or even move really, but they need me to take care of them and I need them for fresh air and cheering up my living space. I think I love my plants as much as some people love a pet. Maybe not a puppy. But at least as much as a gold fish. I’ve actually loved plants years. Botany was my favorite class in high school, and my mom is an amazing gardener, farmer, houseplant mom, and landscape planner. Unfortunately I’ve had a tendency to either kill plants with kindness or neglect. But in the last year or so I think I’ve finally hit my stride. I’ve been able to not only keep these guys alive, but some of them have been so happy I’ve been able to divide or propagate more of them from the same plant. 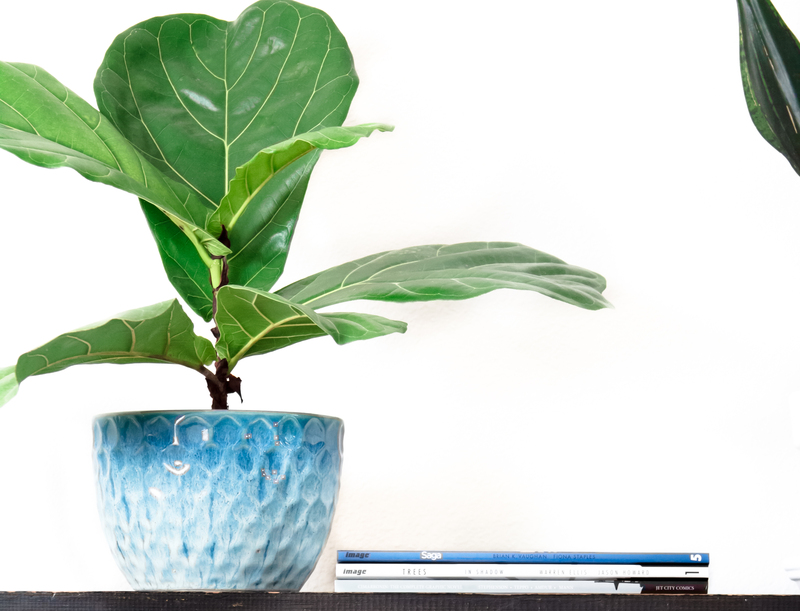 This small fiddle leaf fig was grown from a branch of a much larger fiddle leaf fig we affectionately call Leafs Erikson. The little one is named Groot since he basically grew from a stick I cut off of Leafs. Side Note: Not all of my plants are pictured. Leafs Erikson for example wasn’t included in this photo shoot. Wilted Greens – our green spider plant – wasn’t either. Both Wilted Greens and Leafs Erikson have riveting stories of survival and redemption, but I’ll save those for another day. The cacti in the terracotta pots are new members of the gang. There are two San Pedro (Echinopsis pachanoi) cacti. One’s pictured above sitting on the marble top plant stand, and the other is on the second shelf of the bookcase. There’s also a fuzzy blue Pilosocereus pachycladus cactus. I’ve had all three of them for a couple months and they’re still alive despite being left outside during a massive rain storm. 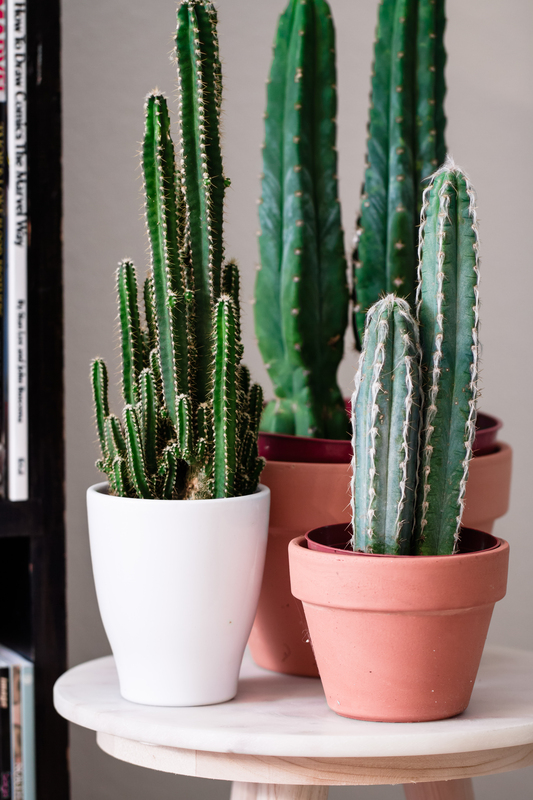 The other cactus (the one in the white pot) is a variety I haven’t been able to identify (if you know what it is, let me know in a comment!) I rescued it from CVS much earlier this year. It was languishing under the fluorescent lights and had hot pink paper flowers glued to it, and I knew I could give it a better home. If you like the mid century inspired marble top plant stand they’re sitting on, check out the post I wrote about how to make it. The three snake plants on the top shelf of the bookcase are from Lowes. There are two varieties. The larger two are a variety called Whitney, and the smaller one is a variety called Black Gold. The larger snake plants used to be in the same pot, but I divided them almost as soon as I got them. They look a little different than a typical snake plant because the pots aren’t so crowded, but I kind of like them like this. Then there are the orchids. 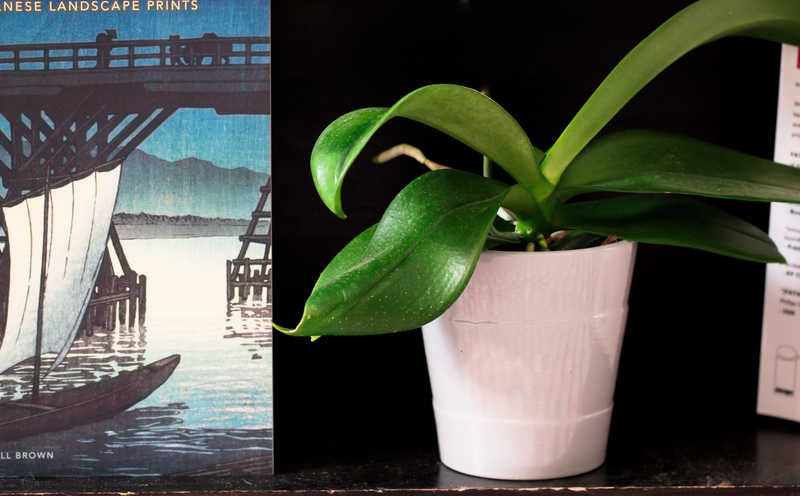 There’s the one pictured above next to my Kawase Hasui wood block print book, and a mini orchid in a terracotta pot next to my Attack on Titan’s on the shelf above. Both were rescued from Lowes’ plant sale section which seems to be perennially stocked with “dying” orchids. In reality, they’re usually not dying at all. It’s normal for orchid flowers to drop eventually (they’ll also grow more flowers eventually), but people apparently don’t want to buy orchids without flowers or think there’s something wrong when they drop. Their loss is my gain, and I’ve been able to buy perfectly healthy orchids for less than half their original price. Anyway, they both have white flowers when they bloom, and I’m currently trying to get them to set new flower spikes for the winter. The fern on the white crate is a Blue Foot Fern. It’s one that has the fuzzy rhizomes above the soil. I really need to do some reading on how to make this plant happier, because while I’ve had it for at least a year and it’s not dead, it’s not doing quite as well as I would like. I’ve seen greenhouse specimens that are have a lot denser foliage than mine. I wonder if it has something to do with humidity? I have a hoya too that’s not pictured. She’s been so happy out on the balcony that I’ve almost forgotten about her. She’s either a Krimson Princess or a Krimson Queen variety and while she’s a cool looking plant, she’s honestly not my favorite. She was an impulse buy, but I haven’t been able to figure out how she fits in with the rest of the plant family. I guess I just need to make more of an effort. I have a running list of plants I would love to have. Thinking of the different specimens I want to collect makes me feel all warm, and fuzzy, and nerdy inside. I would love a Monstera deliciosa “swiss cheese plant”. I’d also like a rubber tree. Oh, and a Chinese money plant would be awesome. They seem to be really popular in Northern Europe but I’m having a hard time finding them in the US. A staghorn fern would be really cool, and I think it would be a neat project to mount one. I love peonies, but I don’t think I can grow them with a North facing balcony in zone 8b. I’ve seen some begonia varieties that almost resemble small peonies but I don’t know where to start with begonias as houseplants. Any advice on any of the above is greatly appreciated. Hopefully there will be at least one plant related post a month, thanks to Urban Jungle Bloggers. If you like ogling other people’s plants as much as I do, it’s a great place to stalk. Plus, they’re giving me a photography prompt every month so I’ll always have fresh pictures of my plants and you can keep stalking my plants without getting bored. Win / win! Want to read more about my house plant family? Pin this image to let me know you liked this post. Next ArticleI’m in with the in crowd. Are you? What a beautiful and airy plant shelfie, Kat! 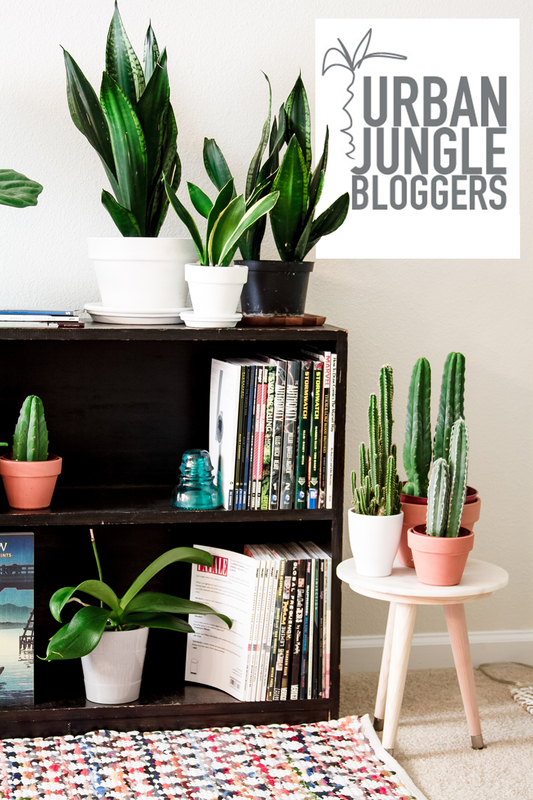 Thank you so much for joining the Urban Jungle Bloggers!! Hi Kat! You may want to check out UT Austin’s greenhouses. Most university biology/botany departments (and associated ‘clubs’) have Christmas plant sales. They are usually great places to get *very* interesting plants quite inexpensively. Awesome! I’ll look into it! Thanks for the tip :) I think Tony got Wilted Greens in a biology department plant sale in Cincinnati. I think the mystery cactus in the white pot is a fairy castle cactus (Acanthocereus tetragonus or Cereus tetragona). Did you ever get your “Swiss cheese plant”?? I am obsessed with them, too. I didn’t want to pay an arm and a leg for a plant, though, so I ordered some seeds online. They grow super fast so it was a very satisfying and rewarding project. I think mine is 2 years old now and it’s about waist high with nicely split leaves. It’s one of my faves.